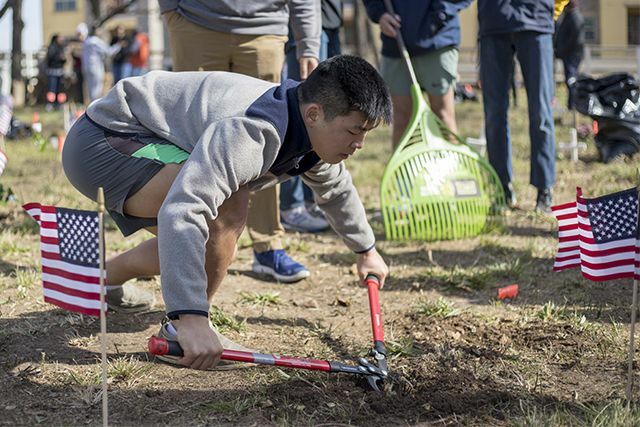 More than two dozen St. Mark’s students, faculty, and staff members spent Martin Luther King Jr. Day giving back to the community. Together with hundreds of volunteers from around DFW, they cleaned and restored Shelton’s Bear Creek Cemetery in Irving. Historians believe that more than 200 slaves, former slaves, and their family members are buried there, many in unmarked graves. The cemetery, which once sat on private property, had become overgrown and unattended until a local community leader organized the cleanup. 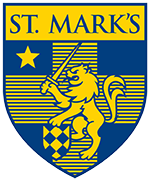 St. Mark’s varsity cross country and track & field coach John Turek heard about the project and decided to take part. Through John's coordination, St. Mark's Community Service team organized 28 student volunteers and supplied flags for the gravesites. Five members of St. Mark’s maintenance team also joined them in the cleanup. For about four hours on Monday, January 21, the St. Mark’s group joined hundreds of volunteers at Shelton’s Bear Creek, clearing brush, pulling weeds, and repairing some of the fences and monuments. As they worked, they also learned. Now, Anthony Bond is hoping to turn the cemetery into a historic landmark to preserve the burial grounds and bring more awareness to the site. 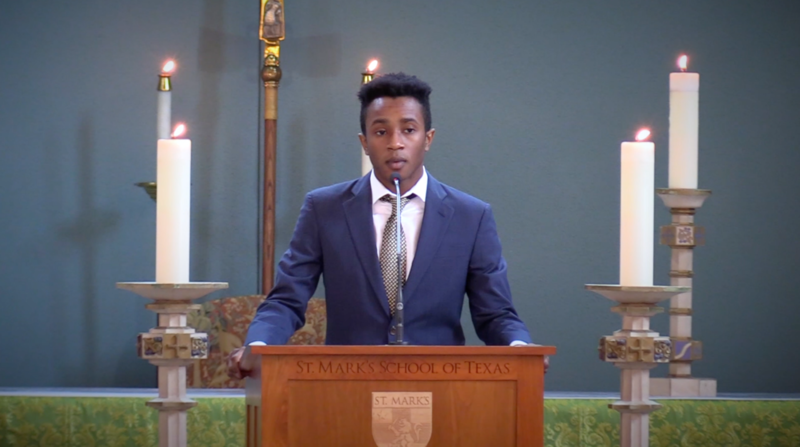 Mr. Dini’s talk to the Upper School Chapel followed two other talks presented by CJ Crawford ’19 during Middle School Chapel and by Shane Ndeda ’19 during Lower School Chapel. You can watch all three of these talks below and learn more about the cleanup at Shelton’s Bear Creek Cemetery in the stories that aired on CBS11, WFAA, and NBC5.